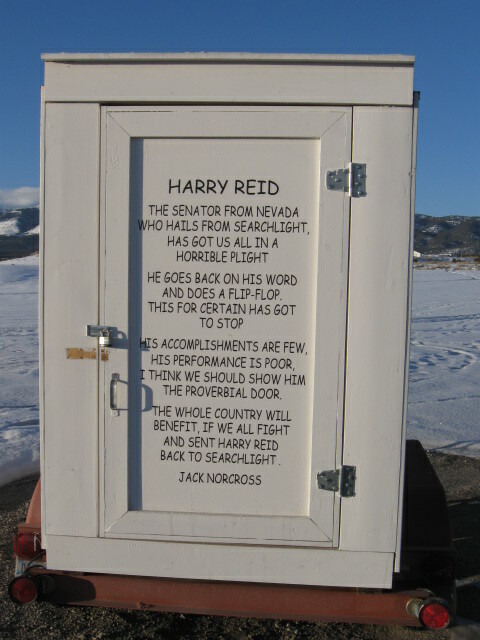 Here’s me reading “Harry Reid” (by Jack Norcross) accompanied by pictures of the trailer I saw the poem on. I took the trailer photos Elko, NV. I have no connection with Jack Norcross, I just saw the trailer while travelling. This was too good not to repost. This post is taken from Michellemalkin.com (all formatting by me). 1. I am a donk first, and an “American” second. When America becomes worthy of me, I might reconsider. 1a. “No” doesn’t really mean “no” when I am doing to you what I know is best for you. 2. The answer to every problem is more government. 2a. When the government creates problems, see 2 above. 3. The American People are a bottomless pool of money — that doesn’t belong to them, but to the government. 3b. If you are more prosperous than me, it’s because you inherited it undeservedly from your parents who screwed over “the poor,” or because you screwed over “the poor” yourself. Either way, you must be punished by having your ill-gotten gains confiscated and re-distributed as I see fit. 4. No sacrifice is too great for me to call upon you to make. 5. Anything which increases the power of government in general, and that of the donkey party in particular, is an a priori good. 7. When I use government to make racial minorities into permanent wards of the state, I am a good person. If you disagree, then you are a racist. 8. When I dissent, I’m a patriot. When you do, you’re un-American. 9. Rules are for fools when they interpose themselves between me and what I want, but they can be helpful as clubs to use on you. There’s lots more, but you get the idea.